The following are a collection of home inspiration, recipes, and blog posts I have found this week that I hope will encourage and edify you on your journey toward connection. Love to make, bake, or create? 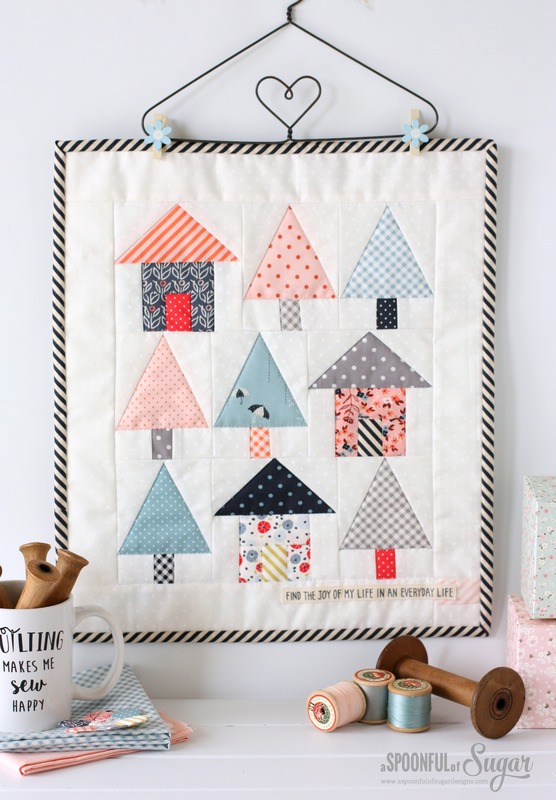 Head on over to A Spoonful of Sugar’s website for an amazing collection of crafts, recipes, and sewing projects, like this tree and house mini quilt, which would make a fabulous New Home gift for a friend or neighbor. Do chore wars leave you feeling like a disconnected, fragmented family? You may want to incorporate these ingenious ideas by Heather at Moments For Moral. ** This post may contain affiliate links. You can find my disclosure HERE. I love the way Fly Lay has helped our family create a more organized home—literally taking it from Chaos to Clean! Ahh, Mary and Martha…This book has been on my to-read list for a while now. I’ve heard wonderful things about it and know that the insights it contains will bless my home and family. Have you read it yet? Our brokenness is a gift that invites authentic connection into our lives. Lisa Murray expresses embracing our brokenness beautifully in this post filled with inspiration and encouragement. A must read post! Do you have a Favorite Thing from this past week to share? Note: I occasionally post in the following linky parties. Feel free to check them out! First: My Favorite Things // April 2018 // This post is jam-packed with goodness! From a SUPER popular mini-quilt, decadent (and healthier!) desserts, a plethora of spring cleaning resources, a spring **GIVEAWAY**, and a FREE Resource Library, this was BOUND to be a popular post! Second: 31 Days To An Authentic Life // A long-time favorite, this post seems to always find its way into the top 5. Check it out when you get a minute. You’ll be glad you did! Third: Extending Hospitality: Everyone Has A Story To Share // Hospitality. We often cringe at the sound of that word. But everyone likes stories, and everyone has a story to tell. Mix hospitality WITH stories and whole new world opens up. A MUCH more comfortable and inviting world. Why not add YOUR story to the stories that are already being shared?! Fourth: Making A Difference—One Person, One Dog, At A Time // Animals. They are irresistable. But this one inparticular stole our hearts and, it seems, the hearts of many of my readers, making this my 4th top post of the month! Fifth: Seeking To Do Good: Turning Our Deepest Sorrows Into Blessings // I’m THRILLED that this post made it into the Top 5 because it contains an idea and a message that I’m PASSIONATE about sharing with the world. Access our FREE library of resources designed to help you create a life filled with AUTHENTIC CONNECTION! I love this idea! That mousse sounds amazing!! The mousse IS amazing! Hope you get a chance to try it. Love the house quilt, some really wonderful ideas. Love your ideas, and favorite things. Also like your link choices. Thanks for sharing all of these fun links. I really need to work on trying new recipes. Happy to have discovered your site. Lots of interesting things to choose from on here. Thanks, Christina! Hope you find something on the blog that will bless your life. Thanks for linking to my spring cleaning post! Happy to do it! It was a great post. Love that mini quilt. My kids did chores right along side of us. We did things as a family work and play. Just packed up hundreds of different items to give to humanitarian cause we are supporting this here. Sounds like your spring cleaning has begun! Way to get the whole family involved! Right!? I fell in love with the mini quilt instantly. And, yes, it is MUCH better than a blender. A lot of great info and ideas!